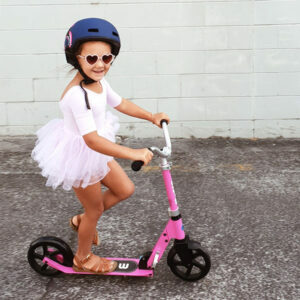 The new trioBike Cargo Big has an extended load platform that’s an impressive 107 cm long at its longest point, giving you tonnes more space for all kinds of deliveries: bigger boxes, longer trees, wider TV screens or happier kids with their legs stretched out. The new size basically means that every fourth load is free! 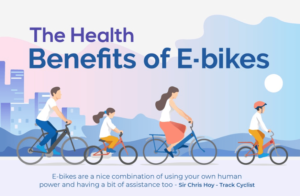 It’s an exciting solution for fast and sustainable inner-city delivery. 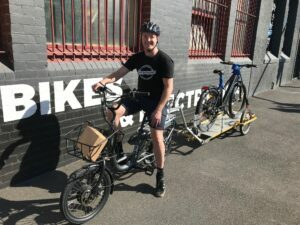 This is a complete package bike, with the trioBike Cargo Big P (in Silver), the extra wide box (in black) and seats and belts for two passengers (in lime green). Nothing has been left to chance with the Cargo Big. The frame has been reinforced at all key pressure points to be able to cope with industrial heavy duty use. It has an extended center tube to make it extremely rigid and completely stable with heavy loads. Every component has been selected and crafted to ensure the Cargo Big is the lightest cargo bike in its category. This means you can be faster and more agile in city traffic. 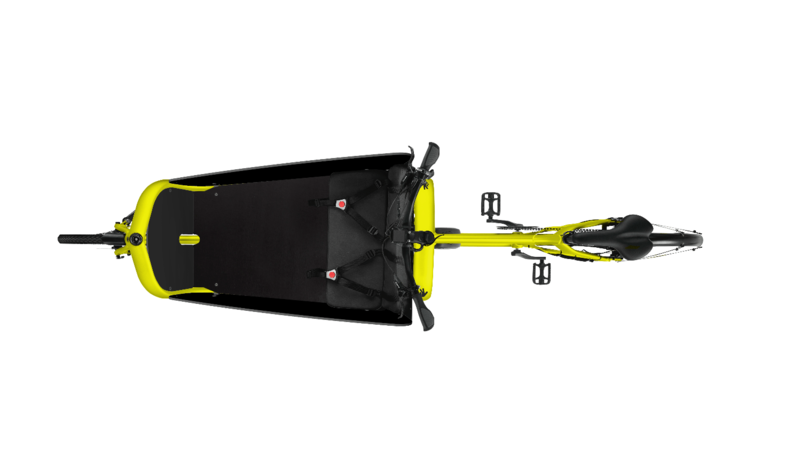 The sharp right turn feature makes for surprisingly easy handling and manoeuvrability. Every detail is geared for top performance. 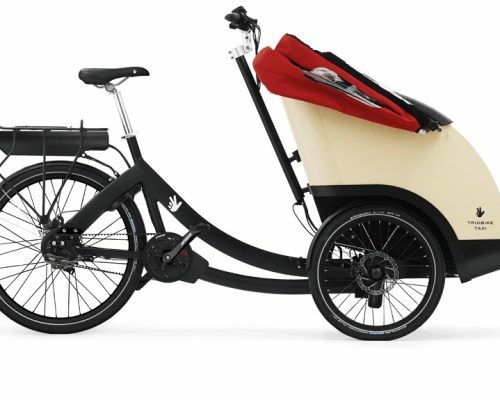 Just like on the trioBike regular Cargo, the new Cargo Big front wheel offers a bigger turning angle to the right. This makes the bike surprisingly agile in small spaces in urban environments. 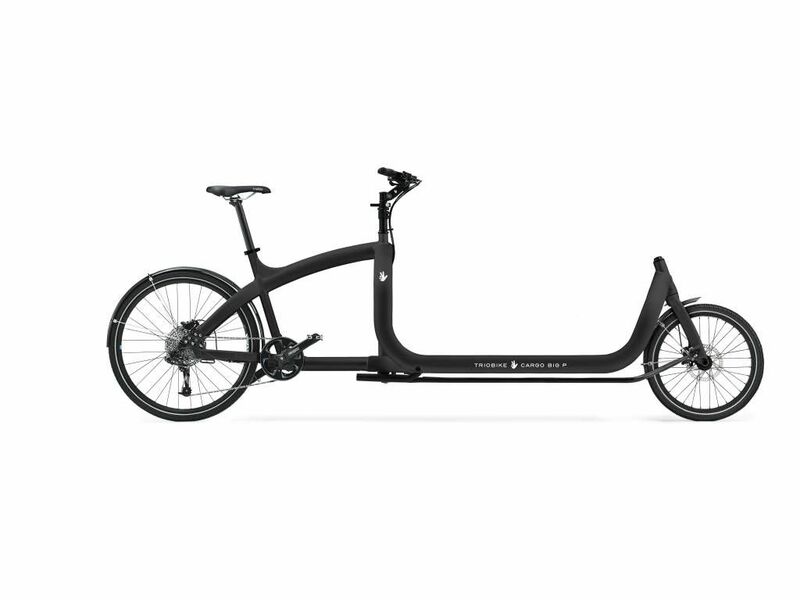 The trioBike Cargo Big offers great performances at a cool price. It has a responsive, external 10-speed SRAM X7 gearshift and high-performing Shimano ZEE hydraulic disc brakes. It is lightweight, with a strong aluminium frame, rigid cross member chassis design, clean lines and a tapered head tube. This model includes the side and bottom panels, as well as a fully padded grass coloured seat for the kids, with 5 point harness for added safety.